I would agree with this video. The Star Trek franchise is actually my favorite of the two. Sorry Ted. These nerds are pretty good with the special effects. First, it sounds like a feminine hygiene product. Gross. Next, everything I wanted to say is wrapped up in a commenter's comment on Engadget. "A giant iphone that can't place a call, can't take pictures, can shoot video, cannot multitask, cannot run Adobe Flash and is ridiculously expensive even before adding the cost of a 3G antenna. Yeah, I'll take three [/sarcasm]" Finally, it is actually the direction I think computers should go. 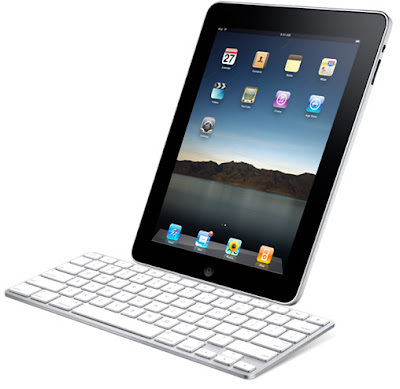 The picture below is what makes me interested, with the attachable keyboard docking station. I also love that you can get iWork (Apple's Office like suite) on it. I believe, and posted about it in 2007 here (scroll down to "Here is a Rabbit Trail"), that computers should go the way of the portable do everything device. This is really a step in the right direction. It's too bad it's been apple-ized. If Apple got there heads out of their "apple cores" and added or fixed the things in the comments from the Engadget reader, I'd run down and buy 3 of them, for realzies. What do you think? I actually missed the fact that Google was going to introduce their own phone. I started hearing about this for the first time at breakfast with some friends on New Year's Day. When I started looking into it, I found that Google was going to announce the Nexus One phone today. The Android software hasn't been out for too long, with phones on Verizon, Sprint, and T-Mobile, but there is a lot of buzz about it. Android is software written by Google for mobile phones. The G1 was the first phone to come out with the Android software. The latest and most advertised has been the Droid on the Verizon network. These are the first phones that seem to be able to generate some interest from the iPhone crowd and those who don't trust Apple and their "proprietary-ism". Because I can not do the phone details justice, and because Google did a pretty simple but detailed job of it here, check out the phone's specs. Better, better, better stats than the iPhone. Let's see if this prompts Apple to release the full potential of the iPhone. Heck, the jail-breakers have made the iPhone great and have shown Apple some things that need to be added or unlocked. They've offered Apple some help in developing other great apps, showing and pushing Apple to make the phone a better tool, and are still showing Apple they need to work on their phone.